This story is late to be posted but I have to share it, because I'm finally done with the ordeal this product caused. At the end of 2012 my nails were horribly stained. I had worn an adorable bright yellow manicure for a full week, and when I removed it I found my nails to be stained not-adorable bright, you-didn't-drink-enough-water-today pee yellow. Ick. Never had they been stained so badly. I love dark polishes, so I'm used to my nails getting a little bit stained, but these were so bad that I was willing to try something to get them pretty again. First off I had tried a basic treatment at home with whitening toothpaste. When that didn't work I tried lemon juice and peroxide mixed in water. It did help them very slightly, but my nails were still very, very yellow. I looked into getting something specifically made for the job. So I went to Sally Beauty, because they carry OrigiNails Bubble White, and the product has rave reviews for getting your nails back to white. At worse I had seen reviews where it didn't work for someone, or that it might take several applications if your nails were really bad off. Obviously my nails were in the "really bad" category, so rather than buy one little packet for $2, I bought the tub for $10. I was sure my nails would take a few treatments, and any extra I had could also be used in a foot bath. It seemed like a good idea at the time. I went home very optimistic about the future of my gross nail beds, and tried it out the next time I removed my nail polish. I followed the instructions to the letter, and soaked my nails for the 5 minutes suggested, then a little extra because to my dismay it hadn't done anything. After 10 minutes it had at least managed to whiten the free edge of my nail, I think because it could penetrate from the top and bottom of my nails there. I will say that the product is easy to use, and fairly pleasant. There is no strong smell, and it fizzes nicely. It left a sort of slimy coating on my skin, probably from whatever moisturizer is released in the water. I washed my hands afterward, but evidently not thoroughly enough. The product has a warning that it may discolor fabrics; it does. It bleached the hand towel I used. After Bubble White treatment the free edges of my nails were white, but my nail beds had barely been changed at all... other than in texture. This is the really bad part. 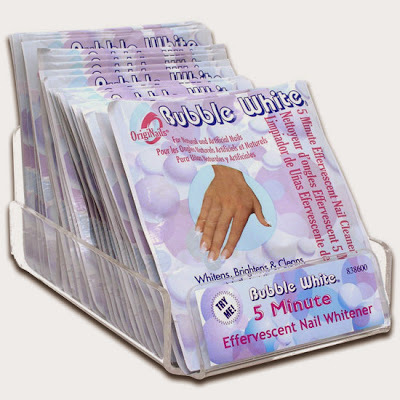 After using Bubble White my nail beds were disintegrating! I had bits of my nail peeling off in little strings. And despite losing the top layer of my nail, they were still yellow. Maybe it's just a really bad idea to ever exceed the 5 minute mark on soaking in this solution, but the label has no warning about the possibility of damage to your nails. No "test on one nail to see how it works for you, if it's okay do your whole hand". No "do not soak longer than 5 minutes". Other than basic poison control warnings there is nothing that indicates that your nails could have a bad reaction. The ingredient list is short and doesn't sound scary. I totally understand that results may vary, but I had never heard of Bubble White doing harm! They had grown just enough that I filed away all of what had been whitened, due to nail breaks mostly, but as you can see they kept on chipping at the corners anyway. Also, check out that weird peely striping on my middle finger... I've never seen anything like it before or since! 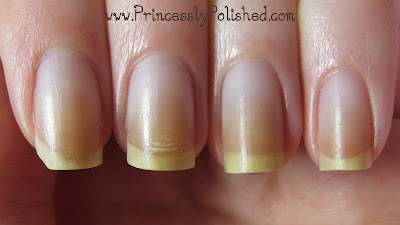 In March I had the weirdest nail break happen, all in the grown-out yellow portion of my nail. You can see how it not only broke in a very irregular way, but also peeled away some of the nail bed. This break wasn't even caused by anything strenuous, and there was no damage (such as a crack) prior to it happening. I just took the plastic lid off of a container and it shred apart. Disheartening to say the least! 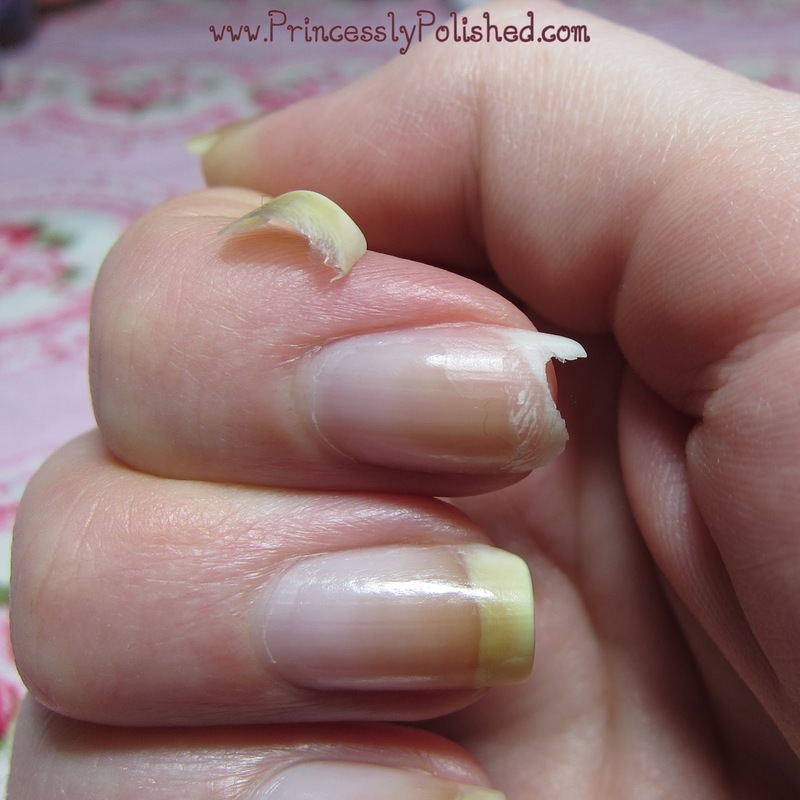 I babied my nails, keeping a clear coat on them and taking my vitamins, and once the yellow (Bubble White treated) portion grew out, my crazy nail peeling and breakage stopped. By May my nails were back to being healthy, long, and their natural color! In conclusion, I do not recommend OrigiNails Bubble White. I know it works perfectly fine for a lot of people, but after what I went through I would never advise anyone to try it. At least test one nail (your least favorite?) first before you do a whole hand!! I wish I had known to do that. Now I'd like to hear your opinion, too! Have you tried Bubble White? How did it go? What is your favorite nail whitening treatment? Rochelle. I am sorry to hear of your experience. However, I would like to make a few suggestions, if I may. 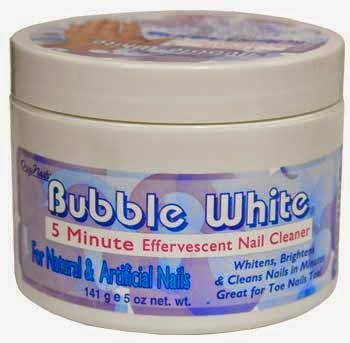 I know many, many individuals, including myself, that use Bubble White and have never had an experience such as this. BUT, I do have friends who have experienced this same problem when they used a "bad" color polish. I, myself experienced some damage after using a "cheap" polish and left it on for more than 3 days. This was disastrous. I will never do that again. I ask that you please research the polish you had previously used, as that may have been the final straw for your beautiful nails. Thank you. Thanks for the suggestion! The polish that had stained my nails was China Glaze Sunshine Pop, and in my experience CG does really well on my nails. No issues with chipping a nail with a CG manicure on. Also, my nails were only stained, not falling apart. The peeling only started after trying to whiten them... I haven’t had this problem since using Bubble White, but if it does happen again then I'll know it isn't from the whitener, since I'm not using that. I'll pay attention to the polishes worn if it happens again. Thanks! Yes, I had used Orly Bonder with that manicure. I always use a base coat when I paint my nails, it's silly not to. Obviously my nails ended up very stained despite that, but they weren't having any issues with breaking or peeling until right after using Bubble White. I know that isn't the norm; I was very surprised when it happened! I'm just sharing my experience and letting people know to use more caution than I did if it's your first time with the product. With all the good reviews out there, and even people saying they soaked their badly-stained nails for 15 mins and ta-da! they were perfect again, I just plunged in. OMG!!!! I just found your post and I just found out the bubble white did the same to my nails. I bubble whited them on tues and put nail polish. I just took off the nail polish and was wondering what the hell happened to my nails. They're peeling away in tiny strips! BEWARE of this stuff! I use dermelect polish and never ever had this problem. I'm flushing the rest down the toilet!